New Delhi: Seventeen people, many of them sleeping guests, were killed in a fire at a hotel in central Delhi’s congested Karol Bagh area early Tuesday morning. Some of the victims were charred to death and others suffocated in the poisonous fumes. A woman and a child were killed when they jumped off the fifth floor to escape the blaze, reports said. A case has been registered against the owner of the hotel, with sections including culpable homicide not amounting to murder. The general manager and another employee of the hotel have also been arrested by the Delhi Police, which has now transferred the case to the crime branch. 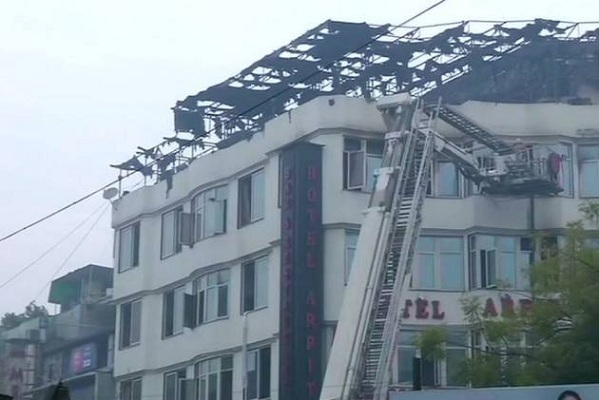 Videos recorded by witnesses showed thick smoke and flames crowning the terrace of the six-storey Hotel Arpit Palace after the fire broke out at around 4 am. A person was seen dangling from the terrace and then jumping off. Police said he died. The fire could have started because of a short-circuit, reports said. Guests at the hotel that is popular with budget and business travellers, were unable to use corridors to escape because of wooden panelling, according to a fire officer. The hotel didn’t have proper fire escapes. The fire was brought under control around 7 am by more than two dozen fire engines. Thirty-five people were rescued and those injured were taken to nearby hospitals. A busy commercial centre criss-crossed by narrow alleys where electric wires dangle overhead, Karol Bagh houses hundreds of hotels, shops and offices, and is packed with tourists and shoppers. The hotel was put up for auction by a state-run bank at a reserve price of Rs. 27 crore on December 31, 2018.